Are You a Planner? On Planning the Sometimes Unplannable. Do you consider yourself to be a planner? Or are you more of a spontaneous, go-with-the-flow kind of person? Well, I, for one have always preferred to plan things out. I just like the unwavering quality behind it; the security of having things set and ready to go. Consistent with this topic, I must mention my love for to-do lists. Ahh, to-do lists – the epitome of organized planning. They provide instant organization to the sometimes unorganizable aspects of life. Moreover, crossing things off of the to-do list? That just provides me with an insurmountable amount of glee. Food Shopping – Check. Send important email – Check. Pick up dry cleaning – Check. I may even add a meaningless item to the list, just for the opportunity to draw an elongated, bright, red line through it. Get through Monday – Check. Perhaps yet another reason why my boyfriend and I get along so well is that he, too, appreciates the benefits of a good to-do list. 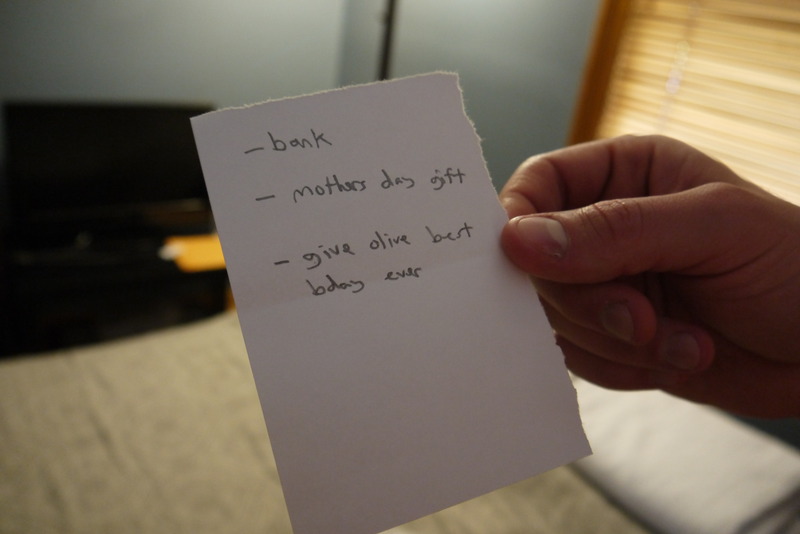 This is Brian’s to-do list from last May. Speaking of planning, my boyfriend and I are currently planning the next few years of our lives together. We are moving in together this summer, which is such an exciting next step for us. We just completed a detailed budget of our joint finances to determine what we can afford – in order to make the best decision for the both of us. Rent or buy? Townhome or condominium? What town? Well, that, my friends is the plan for this year. But next year? Next year is not as clear. You see, my boyfriend is finishing medical school and will be applying to a U.S. hospital for a position as a resident physician. However, the ultra-competitive residency program leaves little room for secured planning. You interview at a hospital, you rank those hospitals in order of your favorite, and then the system “matches” or places you at a hospital of its choosing. As a result, we don’t know where my boyfriend will be placed and, consequently, where we will be living next year. 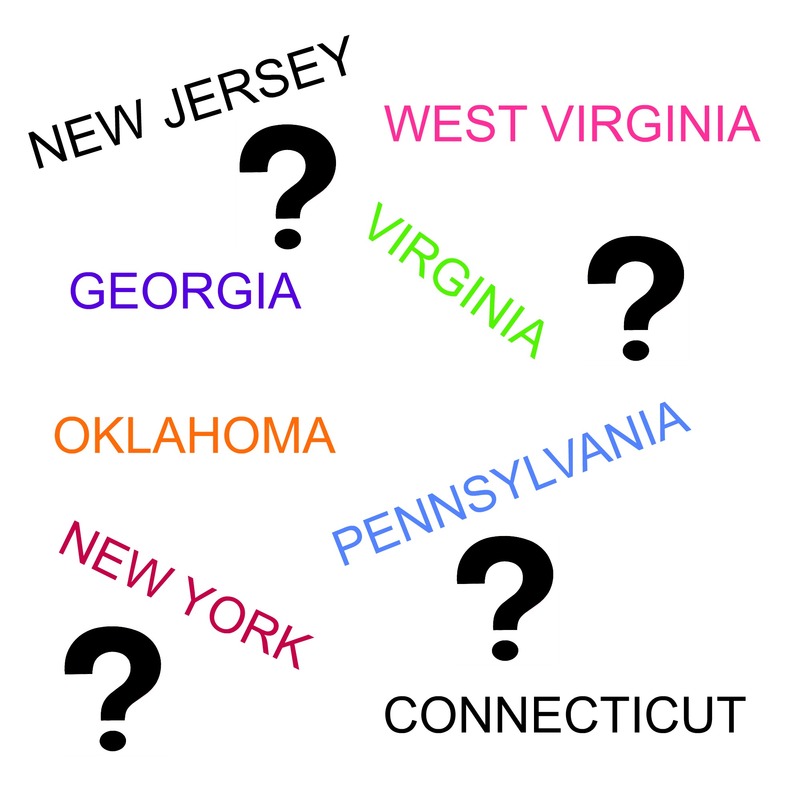 Will we remain in the “Garden State” of New Jersey? Will we be Virginia-ites? Will we be interviewing the security of tornado shelters in Oklahoma? The possibilities are endless. The only thing I know for certain, amidst this whirlwind of potential locales, is that wherever Brian is placed, he will have me by his side. Through all of this, certain life truths have risen to the surface of realization. Sure, some things are capable of being planned. Food shopping, emails, dry cleaning – these are all items which can be placed on a to-do list for us to conjunctively tackle and cross off with that delightful red line. But other things aren’t as easily planned. Take next year’s locale, for example, which leaves an element of uncertainty for Brian and me. But do you know what? It’s okay. As much as I love planning and to-do lists, I have learned not to fear the unknown – for there is beauty in uncertainty. The unplanned is not a cause for fear or anxiety. Instead, it can be viewed as an adventure; an endless opportunity for surprise and wonder. No matter what happens or which way the road takes us (literally), everything will be okay as long as we have each other. So, if you consider yourself to be a planner and find yourself facing unplannable events, just breathe. Whatever life throws at you, whatever uncertainties or unknowns come your way, think of it as an adventure. The universe has a way of making sure we end up right where we belong. So, don’t fret, my planning friends. Raise your catcher’s mitt in the air and, with confidence, say in response to life’s uncertainties: I’ve got this. So, tell me. Do you consider yourself to be a planner? Or are you a spontaneous, go-with-the-flow kind of person? there is a memo feature on my phone that helps keep me organized. i like your message: to just let life flow. I need to do this more! So true, Steph. I do lose my lists from time to time. I always tell myself that there must be “an app for that,” but I haven’t gotten to checking them out. For now, I continue on pastel Post-its 🙂 Thank you for reading! I liked this because it shares a striking similarity to my wife and I. Myself, I prefer to do lists that can be as contrasting on the same sheet of paper as- buy cat food, fix sink, and pull out Emmylou Harris album for a blog quote. I hate putting notes in my phone and would rather stick them in my wallet so I remember them in the morning. My wife keeps them all in her head somehow….or on her phone. But just like you and your boyfriend we are looking at some new changes in the years to come and we are kind of combining the methods you describe. Discussing things first of all, and then determining what is a reality in terms of finances, ability etc.She actually started a new job yesterday in the medical field, and it is a position that could lead to a lot of changes and possibly the where to live lotto you also describe. Though right now we want to stay in the general area for the sake of my parents who are gradually having more issues, we would like to get out of where we are, and it is only by planning that I think we can get there. Someday we may go with the flow, but we are both planners for sure. First and foremost, congratulations to your wife on the new position! I can sense that she is very talented by her successes, but even more of a tell is her ability to keep to-do lists in her head … Mind blown 🙂 I’m so glad that you can relate to this post. It looks like we are both in uniquely similar situations. It will be interesting to see how everything turns out. Until then, we can keep planning what we can! Thank you for sharing, Bri. I had to become a planner when I started using Consumer Directed Personal Assistance for my home care needs. I was always spontaneous, but once I needed someone to help me get in/out of bed, on/off the toilet, etc. I had to start being a planner. Now I am great with logistics and planning! I probably always was a good planner, but I never planned too far in advance before. And that is okay 🙂 I do love the term “organized spontaneity,” though. It has a nice ring to it! Hi, Ellie. 20 moves, wow – that sounds like a fantastic adventure! I love your tips, which I will certainly keep in mind as I make my own moves. Thank you! You make a great point. I suppose that is the key, isn’t it? To be able to adapt when life throws a curve ball in your direction. I’m so glad you found your way. Thank you so much for reading! I am an avid planner. Lists upon lists, it keeps me feel motivated to get things done as I like ticking things off. So weird but it helps 🙂 great post! I’m definitely a planner, but I’ve got A.D.D. & depression, so it’s hard to follow through! I appreciate when I accomplish what I’ve set out to do though! Best of luck to you in your new life! And that’s what counts! Thank you so much! I love lists and, specifically, the sense of accomplishment I get from crossing things off of my lists. I love that feeling so much, if I achieve something extra that wasn’t on the list, I’ll add it just so I can cross it off again! But all that is just for short-term tasks. For further-reaching issues of the “where do you see yourself in five years” variety (I hate that question! ), I have a few vague ideas but nothing’s really concrete. At times, I have a pathological-seeming need to keep my options open and let things shake out however they may. Exquisite, I have such a rapacious appetite for your writing.